DeKalb County Pace swim team member B.J. Berkheimer, 37, swims a warm-up lap with coaching from DeKalb-Sycamore co-op swimmer Mitchel Meares, a sophomore, in the Huntley Middle School pool on Sunday, January 18, 2015. 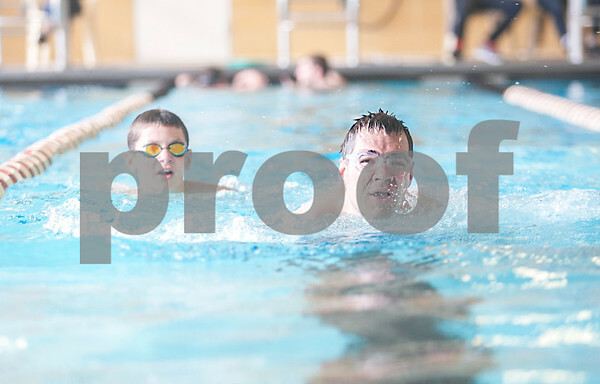 The DeKalb-Sycamore co-op boys swim team was on hand to help the DeKalb County Pace, the county's Special Olympic swim team, record official times for their meet in March.